These days I receive only two things as gifts: crockery and cookbooks. I am not complaining. I love it! 🙂 This trend started when during my first year in grad school my friend, Dayoung, with similar interests in all things gluttonous, bought me this beautiful Korean-American cookbook called Kimchi Chronicles. In fact, my interest in writing about food, recipes, and food histories was sparked by this book.Kimchi Chronicles indoctrinated me into the basics of Korean cooking, and I am now obsessed with Korean food. The simplicity of cooking, the use of fresh and wholesome ingredients, and the complexity of flavors have inspired how I use spices and flavors in my own cooking. 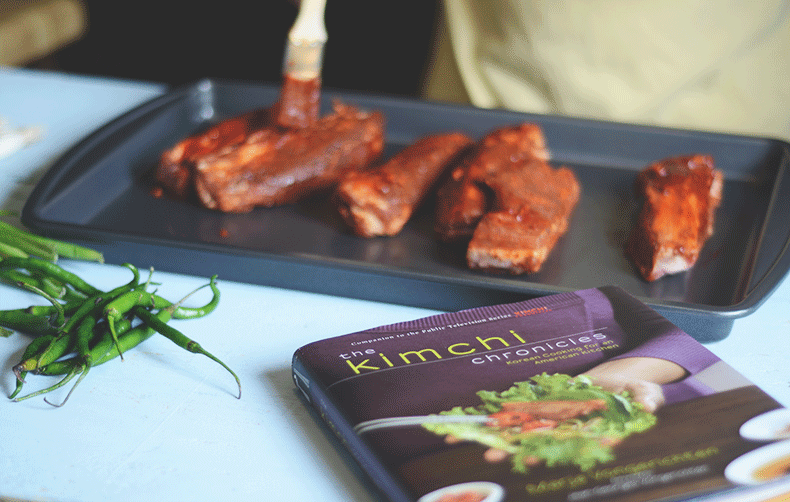 My favorite ingredient to cook with these days is gochujang. This rich red chili paste bursting with flavors and a hint of sweetness can turn any dull recipe into a crowd winner. I have been indiscriminately slathering salmon, chicken, fingerling potatoes, eggplants, you name it!, with gochujang. The results have never disappointed me. Not too long ago I tried a recipe from this book, and everyone was blown away by the outcome. 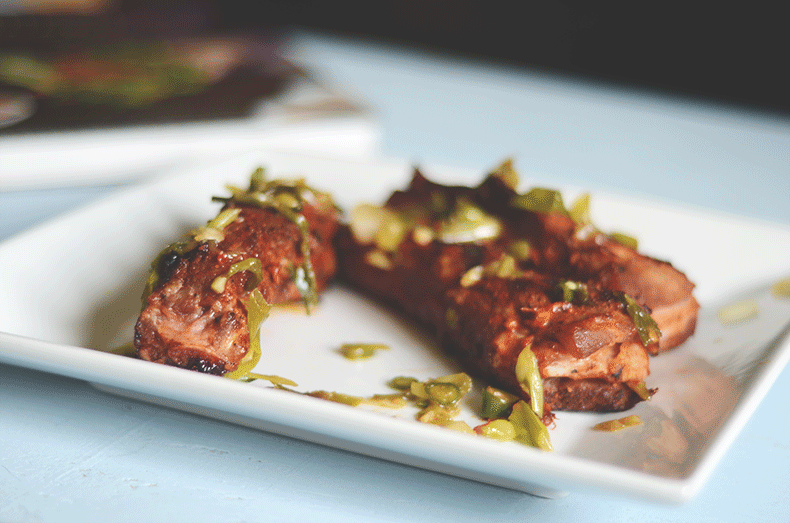 I tweaked the recipe slightly to make a Korean-Indian barbecue, but you can totally skip the coriander and tamarind if you wish. Give it a try and let me know how it goes. Whisk together red pepper paste, tamarind paste, ginger, garlic, coriander seeds, honey, soy sauce, red pepper powder, and salt. Brush the pork chops all over with the sauce. 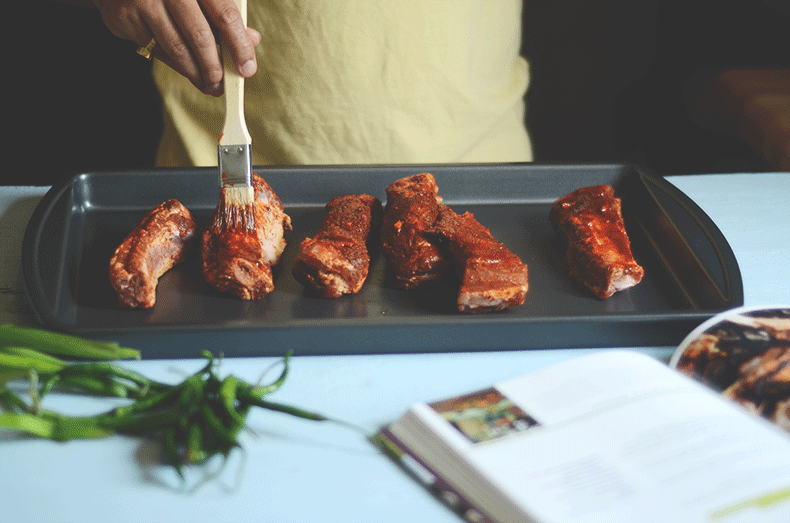 Wrap each rib individually in aluminum foil and arrange them on a baking sheet. Grill in the preheated oven for 2 hours or until fall-off-the-bone tender. You can make them upto 3 days ahead.